A Chimerical World: Tales of the Unseelie Court is now available on Kindle and Nook. This anthology features my story ‘The Enemy of my Enemy’. I was really drawn to the concept of this anthology: I love mythology and folk tales, and have done since I was old enough to decipher words on a page. My story is something of a cautionary tale that deals with the dangers of getting involved with the faerie folk, be they good or evil, and I tried to draw on common themes of bargaining, gifts and changelings to make a story that could fit in with some of the dark fairy tales I read as a child. I’m really looking forward to reading the other stories in this anthology! Synopsis of A Chimerical World: Tales of the Unseelie Court: The Fey have been with us since the beginning, sometimes to our great joy but often to our detriment. 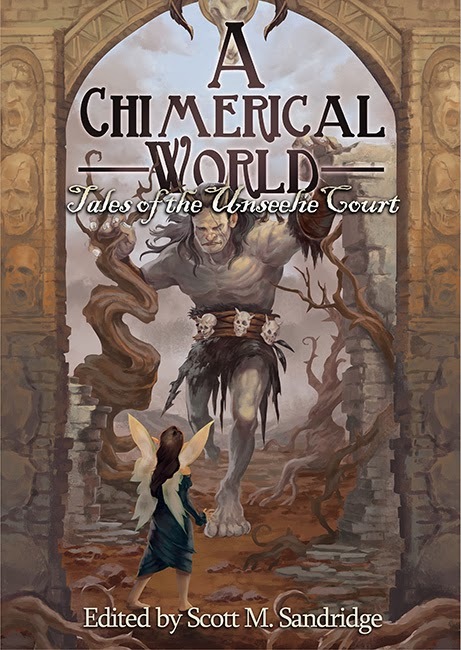 Usually divided (at least by us silly humans) into two courts, the second volume of A Chimerical World focuses on the Unseelie Court: the court we humans seem to view as the “evil” faeries. But “good” and “evil” are human concepts and as alien to the Fey as their mindsets are to us. Inside you will find 19 stories that delve into the world of the faeries of the Unseelie Court, from authors both established and new, including Michael Shimek, Deedee Davies, and Nick Bryan. But don’t be surprised if these faeries decide to play with their food.